The inbound, content-driven approach to Sales & Marketing that has revolutionized B2B lead generation reached critical mass this past year. 50% of all companies are now employing some degree of content marketing strategies and experiencing new growth. Is your business one of them? If so, 2014’s the time to ramp those efforts up. If not, you’d better get on the bandwagon in the coming New Year. With traditional advertising yielding few measurable results these days, and lead lists and cold calls in the deep freeze, content marketing has transformed traditional sales efforts by providing valuable resources to prospective customers that will lead them, organically, to transact with your business. The ranks of those companies employing these initiatives are swelling—and even if you are already among them—the changes and advancements taking place are dynamic. As the following statistics illustrate, you must embrace these evolving strategies to reach your full growth potential in 2014. In 2014, businesses will increase the use of valuable, focused content to deliver targeted and personalized resources to customers who need it, when they need it. Statistics courtesy of digital asset management firm WebDAM, the White House Office of Consumer Affairs and Forrester Research. 1. 78% of Chief Marketing Officers believe that custom content is the future of marketing. 2. Nearly 50% of companies now employ some degree of content marketing strategies. 3. B2B companies with blogs generate 67% more leads than those that don’t. 4. 67% of B2B content marketers consider event marketing the most effective strategy. 5. Inbound marketing delivers 54% more leads than traditional outbound marketing. Those numbers speak volumes and irrefutably illustrate that inbound, content marketing is now the industry standard for generating robust targeted business leads. Historically, no previous “new” method of sales promotion or advertising initiatives ever posted that type of growth penetration. 6. Business will spend $135 billion on digital marketing collateral. 7. Internet advertising will account for 25% of the entire ad market by 2015. 8. Social media marketing budgets will double over the next five years. 9. 55% of marketers increased their digital marketing budget this year. 10. 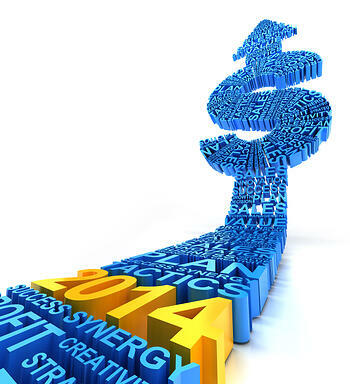 72% of PPC marketers (those who use pay-per-click advertising) plan to increase their PPC budget in 2014. In the 20 years since the Internet emerged as a new business marketplace, it has steadily shifted ad dollars from print, electronic media, display and direct mail advertising. While its clout has diminished, television is still a powerhouse for big-name, B2C consumer brands. But in the B2B realm, where solutions are what customers demand, the Web is almost the exclusive sales & marketing channel of choice. 11. SEO (search engine optimization) is vital — 33% of traffic from Google organic search results go the first item listed. Getting yourself easily “found” on the Internet is, and will always be, essential to growing your business. One of the great collateral benefits of quality content marketing initiatives is that, as they engage your prospective customers, your company will organically begin ranking higher in the search engines. 12. Social sharing buttons in emails increase click-through rates by 158%. 13. 52% of marketers have found a customer via Facebook in 2013. 14. 43% of marketers have found a customer via LinkedIn in 2013. As the Web becomes more and more a mobile experience, the sharing of content, information and images is also more easily shared. Social media-based referrals have become the fastest growing driver of business in the mobile realm. 15. Visual content is processed by the brain 60,000 times faster than text. 16. 73% of reporters think press releases should include images. 17. Videos on landing pages increase conversion by 86%. 18. 65% of people are visual learners, so there will be an industry-wide shift toward to employing visual content in marketing initiatives. While cellphone cameras and video editing software are often more than adequate for producing tutorials, issuing podcasts and hosting webinars, you will certainly see a growing trend in the production of more elaborate and professional video content as the content marketing landscape becomes more competitive. 19. It’s 6-7 times more costly to attract a new customer than it is to retain an existing customer. 20. 89% of businesses have stopped transacting with another company after experiencing poor customer service. As the preceding numbers bear testimony, your increased inbound marketing efforts will generate tremendous leads on prospective new customers. But give your existing client base the same type of gentle massage; you may not know them as well as you should. The attention you provide by virtue of superior customer service will not go unrewarded. Well, the proof, as they say, is in the pudding. Take these 20 statistics and post them on a wall as reminder. Let them inform your marketing strategies in the months ahead and enjoy a very successful 2014. Happy New Year!